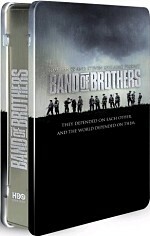 Back in 2001, HBO struck gold with Band of Brothers, an epic mini-series about the European theater in World War II. Almost a decade later, the network dedicated the same resources for the other side of the war via 2010’s The Pacific. The 10-part program launches in December 1941. In the wake of the Japanese attack on Pearl Harbor, the US prepares to battle in the Pacific. We follow three Marines throughout the span of the conflict. Sportswriter Bob Leckie (James Badge Dale) enlists and documents his experiences via letters to hoped-for girlfriend Vera (Caroline Dhavernas). NCO John Basilone (Jon Seda) reups as a Marine sergeant, while young Southerner Eugene Sledge (Joe Mazzello) must sit out the early parts of the war; a heart murmur keeps him on the sidelines. We follow Leckie and Basilone as they fight the Japanese at Guadalcanal and then as they await a new assignment in Australia. Eventually Leckie goes back to fight in Port Gloucester, while Basilone – a noted war hero after Guadalcanal – gets sent home to sell war bonds. Leckie experiences medical issues while Sledge goes through basic – and finally comes into the fight when he hits the island of Pavuvu, where he joins Leckie’s unit. And much, much more! Though perhaps not as much, much more as a viewer might expect – or as much, much more as this viewer expected. I figured Pacific would provide an overall history of the war against the Japanese, with the kind of focus on the movers and shakers that usually comes from overviews like this. Instead, it completely concentrates on the soldiers themselves. Everything here comes from the point of view of the Marines; on those occasions that we see commanding officers or learn of global actions, it comes from their perspectives. Though not what I expected, I really like that decision. It gives Pacific an unusual spin and keeps it from becoming just another long-winded semi-documentary. Oh, it’s long – nearly nine hours – and it does aspire to a documentary feel at times, but it’s definitely not long-winded, and its perspective allows it to become something unusual. While Pacific doesn’t serve as a good overall history of the war, it shows us what the individual soldiers went through, and that includes some surprising elements. The usual war film sticks with battles, battles and more battles, but that doesn’t occur here. Almost entire episodes concentrate on time away from the front. For instance, Episode Three stays with the down time in Australia, while Episode 10 opts for a look at the soldiers’ post-war lives. These decisions give Pacific a greater scope than expected. I may sound contradictory, since I just said the movie goes with a smaller focus than the average war mini-series, but the choice to stick with the soldiers allows for the programs to include material left out of pieces with a broader take. If you see something that concentrates on the movers and shakers, you’re not going to see an hour of soldiers in quiet times. I appreciate the fact that Pacific doesn’t just stick with action and nothing else. The decision to stick primarily with three main characters works nicely as well. To be sure, we learn a lot about quite a few others, but only as they come into contact with Leckie, Basilone and/or Sledge. Those three Marines go through rather different experiences, and long portions of the mini-series go by with no mention of one or another. As already mentioned, Sledge is a non-factor for the first couple of episodes; in addition, wounds send one Marine home midway through the shows, while another dies before the war’s end. Despite the characters’ occasional extended absences from the screen, Pacific still manages to integrate them well. We get a good take on their individual stories and don’t feel the mini-series favors one over the other. That doesn’t mean we don’t take more interest in one over the other, though. Personally, I most liked the time we spent with Leckie, and the Basilone segments came in second. The Sledge scenes tended to be the least engaging, partially due to a somewhat one-dimensional performance from Mazzello. Best known as the little boy in Jurassic Park, Mazzello does little more than play Sledge as angry; he starts off innocent and wide-eyed but soon gets nasty and rarely leaves that attitude. Dale and Seda manage better breadth for their characters; in particular, Dale delivers the standout performance of the three leads. Despite some quibbles about Mazzello’s performance, I find a lot to like here. The Pacific delivers an engrossing account of the war against the Japanese that keeps us consistently involved. It’s a fine mini-series. The Pacific appears in an aspect ratio of approximately 1.78:1 on these Blu-ray Discs. I thought the Blu-ray provided consistently satisfying visuals. Sharpness was generally very positive. A smidgen of softness appeared at times, but those instances were minor. Instead, the program demonstrated nice clarity and accuracy the vast majority of the time. I witnessed no instances of jagged edges or shimmering, and edge enhancement appeared absent. Source flaws also failed to interfere. Colors stayed fairly subdued for the most part. The period setting didn’t favor a dynamic palette, but the hues looked reasonably accurate and full. Blacks were acceptably dark and deep, while shadows showed generally positive delineation; some low-light shots seemed slightly murky, but not to an extreme. Overall, I found this to be a strong presentation. War movies usually opt for dynamic audio, and the DTS-HD MA 5.1 soundtrack of The Pacific provided the expected bombast. The soundfield used the various speakers well. Scenes with battles proved the most involving, as they engulfed the viewer with the sounds of the setting. That side of things worked best, but other sequences also seemed quite good; even quieter placed the viewer in the action and consistently satisfied. Surround usage was pleasing throughout the film, as the back speakers bolstered the various settings well. Audio quality was also good. Speech appeared natural, and the lines never demonstrated intelligibility problems. Music was quite dynamic and lively, as the score showed excellent range and delineation. Effects were also bright and bold, with nice low-end to boot. Across the board, this was an excellent track that deserved a solid “A”. When we shift to extras, the most substantial components travel across all 10 episodes of The Pacific. Enhanced Viewing offers “picture-in-picture” components as the shows run. These mix text facts about events and characters, archival footage, maps, and interviews with a mix of experts and participants. In these, we hear from historian/author Richard B. Frank, historian/author Donald L. Miller, historical consultant Hugh Ambrose, widows Jeanne Sledge and Vera Leckie, veterans PFC Sidney Phillips, Captain Hugh Corrigan, Sgt. Richard Greer, Sgt. Clinton Watters, Sgt. RV Burgin, PFC William Leyden, PFC Eugene B. Sledge, and PFC Chuck Tatum, Burgin’s wife Florence, and PFC Phillips’ sister Katharine J. Phillips Singer. Throughout “Enhanced Viewing”, the material tends to fall into two categories. We get facts about the war and 1940s society from the historians and anecdotes/personal thoughts from the others. This isn’t a perfect distinction, as some overlap occurs, but it covers the elements pretty well. And “Enhanced Viewing” covers the mini-series quite well itself. I really like the mix of topics, especially since the shows themselves don’t give us a lot of historical perspective; the various experts are able to fill in some blanks from the programs. As for the veterans and their relatives, they add real depth to the piece. It’s great to put real-life faces to the characters, and they throw in many fine stories about their experiences. Overall, “Enhanced Viewing” gives us a layer of substance that makes The Pacific even more rewarding. I want to note that “Enhanced Viewing” comes with a user-friendly interface that reduces frustration. Rather than have to wait for each component to appear, when one ends, you can easily skip ahead to the next. That’s great, as it allows you to navigate them more efficiently. Granted, they pop up often enough that we don’t get stuck with much dead air, but I still really appreciate the ability to jump from one clip to another. All 10 episodes also can be examined via a Field Guide. This offers exactly the same types of information found during “Enhanced Viewing”, so expect the same participants and topics. However, that doesn’t make the “Field Guide” a redundant waste of time. While a few of the same tidbits emerge – usually in the form of character biographies – quite a lot of new clips and details pop up across the elements. This means that we learn even more about the subjects and get a greater appreciation for the stories. All 10 episodes can be viewed with Historical Background. Each clip lasts between one minute, 13 seconds and two minutes, 52 seconds for a total of 22 minutes, 59 seconds. These come with narration from executive producer Tom Hanks as well as interview remarks from Sidney Phillips, Richard Greer, William Leyden, RV Burgin, Hugh Corrigan, Clinton Watters, Vera Leckie, daughter Joan Leckie Salvas, and Chuck Tatum. Each one offers a prologue for the particular episodes and helps set up those narratives. They’re all short but compelling. A sixth disc consists solely of extras. Profiles of The Pacific offers a six-part documentary that concentrates on the series’ characters. 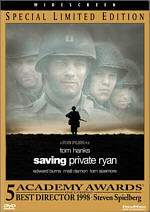 It runs a total of 48 minutes, 26 seconds, and includes notes from Greer, Watters, Frank, Tatum, Ambrose, Phillips, Jeanne Sledge, Burgin, Eugene Sledge, Vera Leckie, Corrigan, Singer, Leyden, Florence Burgin, Basilone family friend Anne Navatto, Basilone schoolmate Victoria Melitsky, Basilone lifelong friend Steve Del Rocco, Sr., Basilone Parade Committee treasurer Peter Vitelli, brother Donald Basilone, sons John and Henry Sledge, daughter Joan Leckie Salvas, veteran Robert Leckie, and son David Leckie. “Profiles” examines the lives of John Basilone, Eugene Sledge, Robert Leckie, Sidney Phillips, RV Burgin, and Chuck Tatum. It gives us another chance to hear from the real-life people behind the movie’s characters, and it throws in many more valuable and interesting observations. It’s a good collection of information. For actual behind the scenes material, we go to the 22-minute, 36-second Making The Pacific. It features remarks from Sidney Phillips, RV Burgin, Richard Greer, executive producers Tom Hanks, Gary Goetzman and Steven Spielberg, director (Part 4)/co-executive producer Graham Yost, writer/co-executive producer Bruce McKenna, senior military advisor Capt. Dale Dye, director (Parts 1, 7, 9)/supervising producer Tim Van Patten, director (Parts 2, 8) David Nutter, director (Part 6)/co-executive producer Tony To, visual FX supervisor John Sullivan, supervising art director Dominic Hyman, set decorator Rolland Pike, director (Part 5) Carl Franklin, production designer Anthony Pratt, You Yangs art director Jeff Thorp, and actors James Badge Dale, Rami Malek, Joe Mazzello, Keith Nobbs, Jon Seda, Joshua Bitton, and Scott Gibson. “Making” looks at the series’ development, story, characters and research, cast, training and performances, sets and locations, and shooting battle sequences. Though pretty standard fare for this sort of “Making of” program, this one manages reasonable depth. The first part offers a bland recap of the film, but once we get into production details, it improves. Nothing here dazzles with insight or depth, but it’s fairly informative. Finally, we get a featurette called Anatomy of the Pacific War. It goes for nine minutes, 59 seconds and provides comments from Dye, Spielberg, Miller, Eugene Sledge, Frank, Leyden, Hanks, Ambrose, Phillips, Greer, Burgin, historian/author Dr. Akira Iriye, and historian/author Dr. John Dower. “Anatomy” offers general notes about the war, with an emphasis on the Japanese culture and other facets of the overall conflict. Despite its brevity, it delivers a pretty good little recap that covers the basics well. With its focus on the “soldier’s eye view” of the war, The Pacific doesn’t deliver a broad general history of the conflict against the Japanese. And that’s fine with me, as it does provide a consistently engaging, moving take on the experience of a handful of particular Marines. 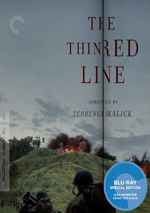 The Blu-ray offers very good picture, excellent sound and a nice collection of supplements. 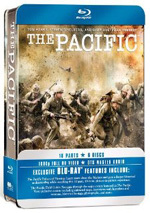 The Pacific is a classy mini-series, and this Blu-ray brings it home in a satisfying manner.